The University of Virginia’s Miller Center released a report on Wednesday proposing five innovative, nonpartisan and actionable ideas to help create middle-class jobs by maximizing the resources available to entrepreneurs. 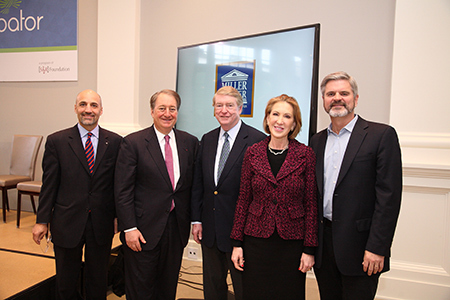 The report is the work of the Miller Center’s Milstein Symposium Commission on Entrepreneurship and Middle-Class Jobs, led by Steve Case, co-founder of AOL and chairman and CEO of Revolution, and Carly Fiorina, former chairman and CEO of Hewlett-Packard. The effort is part of the Milstein Symposium: Ideas for a New American Century, an initiative that is bringing together policymakers, business leaders, scholars, and journalists to define and advance ideas and policies to help create middle-class jobs and help rebuild the American Dream. In the symposium’s first year, separate commissions are studying job creation in three areas: entrepreneurship; manufacturing; and infrastructure investment. The University of Virginia Darden School of Business is one of the world’s leading business schools, offering MBA, Ph.D. and Executive Education programs. 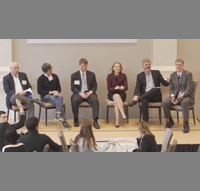 The Batten Institute at the Darden School of Business improves the world through entrepreneurship and innovation. The Batten Institute was established with gifts from U.Va. alumnus Frank Batten Sr.
Click here for an article about the report in Inc. magazine. 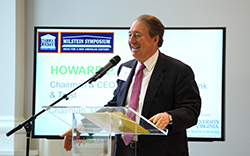 Howard Milstein introduces panel discussion on "Can Startups Save the American Dream?"